My friend Alex Santos in Canada recently went to get petrol at a gas station and snapped this photo. 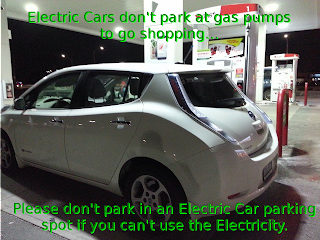 I couldn't resist the image as one of the biggest concerns we Electric Car drivers have is the problem of ICEing, which is when a driver of a car, typically powered solely by an Internal Combustion Engine parks in a spot designated for Electric Vehicles and containing an easily accessible EVSE. Signs informing the driver that the location is reserved usually don't help and notes without enforcement are often thrown away as my friend Lanny Hartmann has video to testify. And although enforced towing does tend to succeed, that can sometimes cause a backlash among a business's customers. To that effect, sometimes pictures speak louder than words and in that I hope this Public Service Announcement can help bridge a gap and explain why we Electric Car drivers are so concerned about the issue of ICEing.